A sojourner is a traveler; one who typically stays a short while. However, sometimes the journey, or the stay, takes on a life of its own. In my Bible reading I have been wandering through Exodus, Leviticus, and Numbers. I marvel at how the Children of Israel, chosen as God’s people, tried in so many ways to wander away from God, but our faithful God continually brought them back. Eventually these sojourners were delivered to the Promised Land. This weekend I heard a wonderful, miraculous story about a people brought through two hurricanes to a different kind of Promised Land they call Promise Lane. See their story here. It started with an hour long drive to the airport from the hotel where I was a speaker for a conference of early childhood teachers each with a ministry of their own. I asked my driver what was his second job. He told me he did video ministry for a church called Smoking for Jesus Ministry. He got my attention and I asked for more . . . The church began in New Orleans, in the 9th ward. 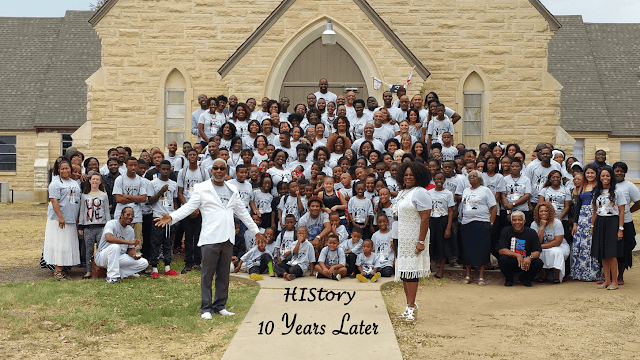 When Hurricane Katrina threatened, 50 families from this group evacuated to a camp in Texas only to be evacuated again due to Hurricane Rita three weeks later. The end of their sojourn brought them to Marble Falls, Texas and now to a former camp turned ministry and neighborhood. Yes, you read that right, over 150 people, almost an entire congregation, moved more than 500 miles away and set up camp to do the work God set before them. I asked if my story teller missed New Orleans, but then I realized most of his friends and family came with him. He does miss the food, but the ministry runs a New Orleans’ style restaurant. Think of the faith with which God has blessed these folks. Think of His love and protection for them – not only as individuals, but for their families, and their church family. I am reminded of my ancestors, several generations back; sojourners of a different sort, who boarded two boats headed from the Saxony area of Germany to St. Louis, Missouri. One boat was lost at sea taking many of my relatives with it, but a several-greats grandfather survived, built a life, a family, and a church in his new homeland. There are more than a few ways to be sojourners. Sometimes God asks us to pack up and move – quickly. Sometimes we come back, but more often than not we are expected to rebuild a new life. Sometimes our sojourn is not a physical move. Instead, it is a sojourn of ministry. Perhaps one door closes and another opens. Grief causes us to linger at the closed door and ignore the new one. It is only by God’s urging that He reminds us He is present in each place and throughout the transition between places. When we sojourn in this way our task is the same. We must set up camp and proceed with the work God sets before us. When the Children of Israel were about to enter the Promised Land, a foreigner named Balaam was hired to curse them. God’s people were immigrants, soon to be inhabitants and those who lived in the area were dead set against being conquered. No matter the nature of our sojourn, no matter where our faith takes us, Jesus, the star of Jacob, is always with us. He is woven in and out of our work and our journey.